Where can I buy pre-punched GBC comb paper? 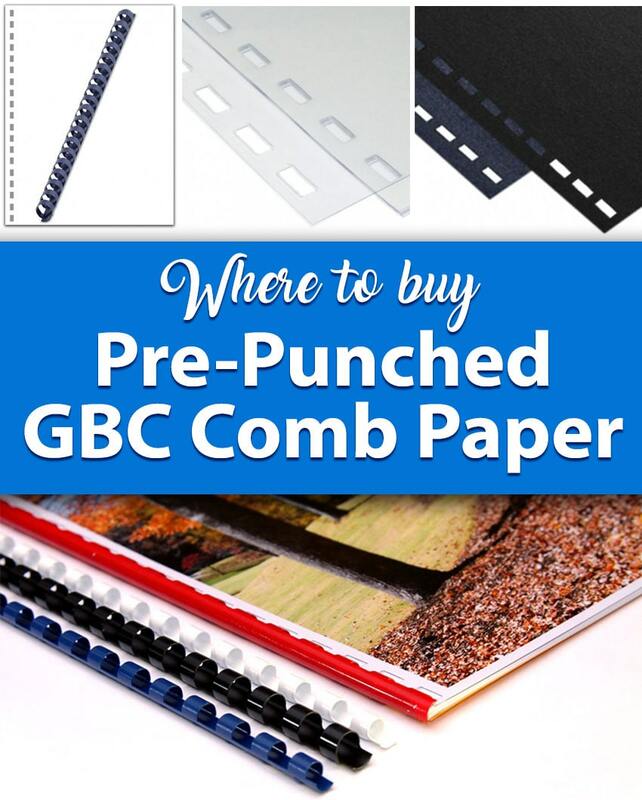 Q: Where can I buy pre-punched GBC comb paper? A: At Binding101 we stock pre-punched GBC comb paper in a standard 20 lb. bond white copy paper, which is compatible with all printers and copiers, as well as the standard 19-ring plastic binding combs. This means that no matter what machine you are using to print your documents to be bound, our pre-punched comb papers will work*. We also stock various report binding covers that are punched with the GBC comb punched pattern. With pre-punched paper and covers, you don't have to buy a comb binding machine. Instead, all you need is a comb opener to bind with plastic comb binding supplies. Here is a list of the various comb-punched pages and binding covers readily available. And don't forget that if you don't see the exact item you need, we may be able to custom punch it for you; just call us at (866)537-2244 (866)537-2244 for a custom punched quote. • Pre-Punched Paper for Comb Binding - Adding a case or pre-punched comb paper to your stock allows for quicker on-demand document binding. Instead of having to punch your pages with a comb binding machine, you can use our professionally punched pages and simply print and bind, without the tedious and time-consuming step of punching. Our stocked punched paper is made of a standard 20 lb. bond copy paper, making it universally compatible with printing equipment. They are 8 ½" x 11" letter size, and a bright white color. Available in two brands (Hammermill or generic), you can buy punched paper in case-quantities, which have 5,000 sheets. They have 19 rectangular holes punched along the 11" edge, and spaced perfectly for your GBC comb bindings. • Pre-Punched Clear Acetate Covers for Comb Binding - Also called clear gloss covers, keeping clear acetate punched covers on-hand makes creating presentations with your comb bindings look more professional. They allow for a crystal-clear view of your first page, so you can customize each book to whatever your need at that time. On-demand document binding has never been faster or easier than when you have pre-punched clear covers on-hand. We stock them in several popular sizes, including letter size 8 ½" x 11" and over-sized 8 ¾" x 11 ¼", 9" x 11", and 9 ¼" x 11 ¼" options. You can also choose from different clear cover thicknesses, including lightweight 5 mil, medium weight 7 mil, or heavy weight 10 mil, all of which are flexible and offer the same clear-view through. They are packaged with 100 cover sheets per box, but can also bee bulk-purchased with discount pricing. • Pre-Punched Vinyl Covers for Comb Binding - Vinyl covers can be used as front and/or back covers, and offer a more upscale and premium look. They are a sturdy report cover that has a faux leather-like texture and feel, while still being flexible. We stock these popular binding cover pre-punched for comb bindings in the most popular colors, including a deep black and dark navy blue, as well as two popular sizes, including 8 ½" x 11" with square corners or 8 ¾" x 11 ¼ with two rounded corners. They are a 15 pt. thickness and our most popular document binding cover available. You can buy punched vinyl covers in small packs of just 100 covers, but bulk pricing is also available for higher quantities. *Confirm with your printer/copier compatibility; if paper sensor overlaps punched holes, they might not be compatible.